Willie Nelson doesn’t mince words to make a point. 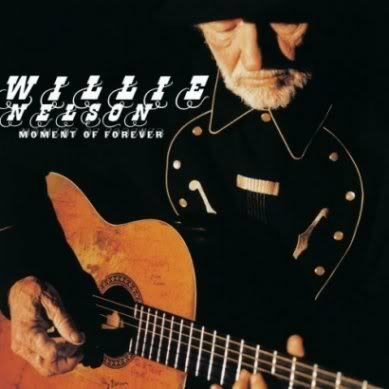 In much the same way, whether on behalf of his country or his heart, Willie Nelson cuts to the bone, sounding authentic as ever on his latest album, Moment Of Forever. The American music legend, who turns 75 this year, sounds like he still has something to prove and, with this effort, he succeeds. While interpreting ten tracks written by others, Nelson also contributes three original songs. Produced by Kenny Chesney and Buddy Cannon, the album works so well because the music accommodates Nelson’s vocal rather than distracting from it. For instance, the title track and “Keep Me From Blowing Away,” both complemented by gentle acoustic guitars and piano, are among the most touching songs Nelson has offered in recent memory. Likewise, his performances on “Over You Again” and “Always Now” embrace a certain emotional vulnerability that makes him seem ironically resilient. In addition to the aforementioned rendition of “Louisiana,” two other conspicuous covers stand out: Dave Matthews’ “Gravedigger” and Bob Dylan’s “Gotta Serve Somebody.” On the former, Nelson sounds as ominous as the shadowy music seething and swirling around him. On the latter, which runs nearly ten minutes long, he commands the pointed lyrics with such authority that this may indeed be the song’s definitive version. Not to be eclipsed by darkness and dogma, Nelson displays his ubiquitous sense of humor on “You Don’t Think I’m Funny Anymore,” a self-penned tune on which he asks, “Did you hear the one about the dirty whore?” Of course, you probably won’t hear this one on your local country radio station. All kidding aside, Moment Of Forever finds Willie Nelson in his element, singing quality material with absolute conviction. His distinctive ability to interpret a song that, in turn, gives voice to others, remains his greatest contribution to music.